Polish pianist and statesman Ignacy Jan Paderewski was a regular visitor to Western New York in his life time. One of his earlist trips would have a profound effect on his life. On April 27, 1905 a train from Canada rushed to Niagara Falls carrying a fearful Ignacy Paderewski. The pia­nist and composer had lost all feel­ing in his arms and believed his life to be over. When Paderewski arrived in the States he called upon an acquain­tance of his that he believed could heal him, Dr. Francis Fronczak. The skillful doctor was able to heal the future prime minister over the course of a week. From then on the two would become friends, leading to more visits by Ignacy to Buffalo. 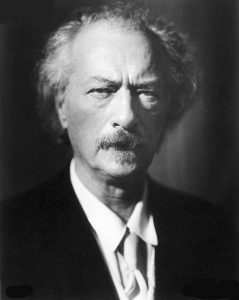 During a 1928 visit to the region, the Polish Singing Society of Buffalo made Paderewski an honorary life member. On June 29, 1941, Paderewski died. To honor this great man, a recommendation was sponsored to the Buffalo Common Council to rename Memorial Drive after Paderewski. In the circle the sponsors wanted to erect a statue of the great man that would look upon the Central Terminal. When it came to vote the proposal renaming the street was defeated but the idea of renaming the circle was kept alive. The idea of only having the circle renamed did not sit well with Buffalo’s Polish Americans. On July 22 a new proposal was offered where the city would rename 16 blocks of Lovejoy starting with the foot of the street at Emslie and ending at the circle in front of the terminal. This change was accepted by the Polish community. On July 30, 1941, Mayor Thomas L. Holling approved the resolution and Paderewski Drive was born.